Usually, I play on bigger stages – at least in Japan. While on these big stages, I feel quiet emotions, I’m calmer. But today, on the smaller stage of the Tokyo Space Odd, I don’t know… Maybe it is linked to the fact that I’m in the country of revolutions? Anyway, I felt a very strong energy at this moment. That’s why my own feelings evolved on stage. In fact, my emotions evolved all along the show. At the end, I felt a lot of kindness. 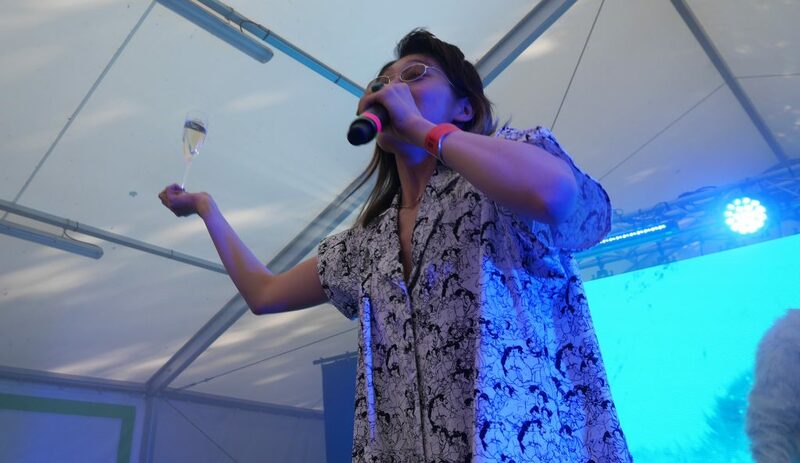 Note that one of the bartender offered me a glass of champagne early in the show, and the fact I don’t digest alcohol may also explain my behavior. Since you’re talking about live performance, were you expecting such a positive reception from the French audience? After all, those 2 shows were your first in Europe. 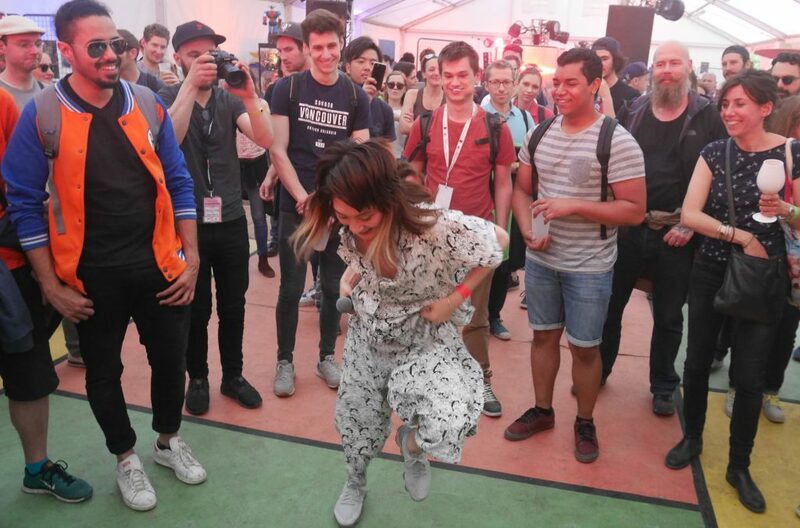 I had the feeling that I had to literally get the audience, to pick them up to watch my performance. At the end of both shows, some people approached me, telling that they came here specifically to attend my shows. It was very moving. But in the end, my goal is to impact the people who just discovered me, live, here and now. I think I managed to reach that goal, to get attention from people who didn’t know me before the show. It’s funny, because right after your first show here, I spoke to one of your fans, Ali, who made the trip all the way to Reims, France, from Qatar! 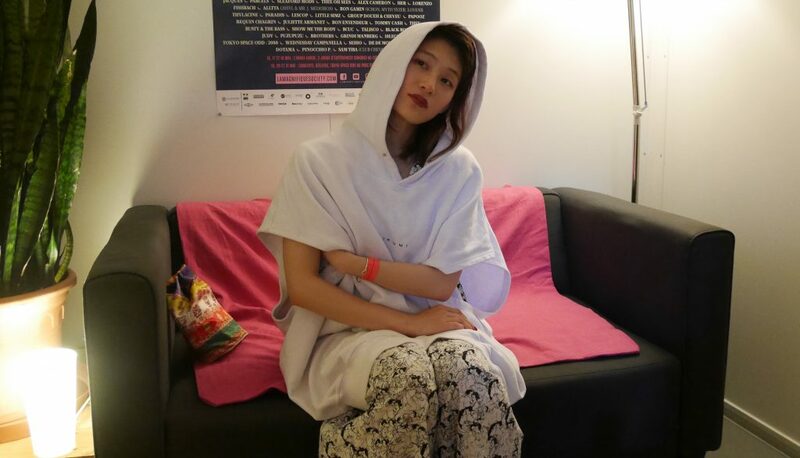 He’s wondering how you manage to push the limits of live performance the way you do (author’s note: in her beginnings, KOM_I had skinned and cut the carcass of a deer; nowadays, she does crazy stuff like slamming in a giant bubble, or the occasional singing and dancing up on a ladder). I’m a very physical person. I’m really looking for touch and physical stuff, I can’t stay in place, that’s what matter to me. I’d like to be able to do something else than just moving everywhere. But at the same time, I’d like to nurture this energy. I try to put myself into the shoes of the audience, who also comes to watch a physical performance. I can also explain this showcase of physical energy with the fact that I don’t have, per se, a musical background. Initially, I was more into live entertainment. I like to visit art installations, or watch theatrical performances. The way I act and move on stage follows this passion for live performing. You joined Suiyoubi no Campanella after its creation by Hidefumi Kenmochi and Dir. F. Just like you said, you don’t come from a musical background. In this context, how did you go to rapping? Indeed, I joined SuiKan after Kenmochi-san invited me. On the very first album, I was simply singing. Since I don’t really have a powerful voice, only ambiant productions matched with the way I sang. That’s why our first tracks follow this path. But since we were looking for something more impactful, to catch the audience, we tried rap. At first, I thought that it wouldn’t work with my voice. But it gradually became a part of my personality and my style. It’s now something intriguing, and I like that. 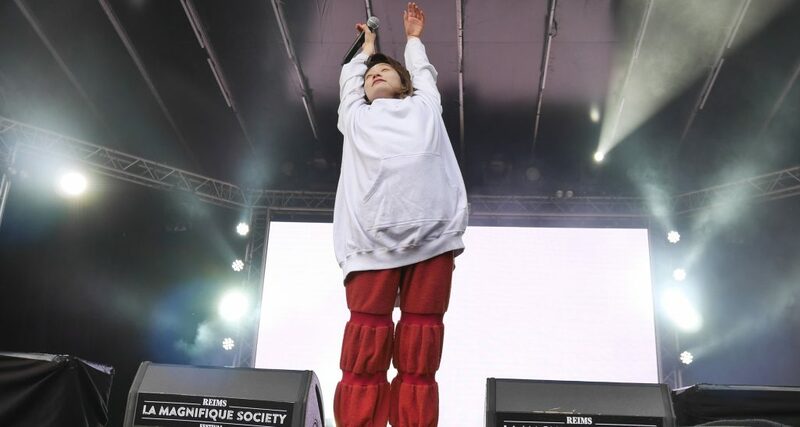 Today, it seems that we see more and more women in Japanese hip-hop. I’m thinking about Charisma.com, Akko Gorilla, DAOKO, ZOMBIE-CHANG… Do you think that women are the future of this musical genre? It’s true that in Japan I’ve been introduced as part of an ongoing trend of female hip-hop. It helped us a lot to promote Suiyoubi no Campanella! To me, I see rapping as an extention of girl talk. Women can talk a lot, and fast. If they talk fast enough, it might turn into rap! The punk-rock scene had a lot of female bands, with strong identities. But I don’t know if the same thing exists in hip-hop today. I’m not sure these kind of personalities exist. To be honnest, I think male Japanese rappers more interesting. Though, as artists who express deep emotions, female rappers might be more fortunate. When male rappers are deeply involved into music, they can manage to create something well organized and interesting. But I think that female rappers can create something equally powerful and beautiful using their emotional strenght, which will get the heart of the audience directly. We don’t need to wear some kind of armor, we just need our voice and verses. Rather than showcasing our technicality, we can go on stage and open ourselves more directly. Recentlyn that’s something I saw way more often with female than male rappers. Akko Gorilla and ZOMBIE-CHANG are these kind of artists, I think. Who are the artists who inspire you, today? If we’re talking about French artists, I like Lizzy Mercier-Descloux a lot. She was a singer working with ZE Records in the 80’s. I like how she was an outsider, with a powerful and touching, yet quirky voice. Her force doesn’t come from her, screaming, or something like that, it’s more complicated, genuiney human. It’s very cool and beautiful. Tonight, I’ll go to watch Camille perform. She has a similar universe. Yesterday, I watched Sleaford Mods… In that case, the artists bared. The sound was kind of empty, but the beauty of the band comes from that. On the Japanese side, I like Kimonos, who sing both in Japanese and English. There is a kind of melancholy in their sound, so I think it might work outside of Japan. Otherwise, US artists like Denzel Curry or Princess Nokia talk directly to my guts. They are both twenty-something, young, and very skilled. Here in France, if people know you, it’s mostly because of your music videos and the global aesthetics of the band. Though, there is a real wittiness in your lyrics. You manage to tell a recipe in Chaplin, or make multiple references to French history in Marie-Antoinette. How do you do your researches? Actually, each time we decide to talk about a new topic or person, especially when it’s serious, it becomes more difficult to be witty. For example, Zeami talks about the founder of the noh theater, so we kept it subtle. We faced a similar problem when writting Marie-Antoinette. Since she can still be seen as a historical yet controversial personality, we decided to turn it in a fun way. In the song, she becomes a bored office lady. However, we also managed to insert historical aspects into the lyrics. From time to time, we receive messages from History students thanking us because the song helped them review their lessons! While we’re still talking about lyrics, I noticed that so far, 3 SuiKan songs are dedicated to French personalities (Marie-Antoinette, Napoléon and Jeanne d’Arc). Which appeal do you find in French culture or history? I think that Paris is the most fantasized city by Japanese people, way before London, Milano or New York. Paris is still number one. It’s something deeply embedded in the Japanese culture. When you grow up in Japan, you learn a lot about French History – should you want it or not – in school, but also in popular culture – I’m thinking about The Rose of Versailles. It’s kind of part of the Japanese culture, in a way! We’re kind of knowledgeable in French culture! When we write new tracks, we’re usually looking for interesting personalities. And among these important, interesting historical personalities, well, there are a lot of French people! In the music video for Jeanne d’Arc, you turn her into a bus tour guide. Where do all these clever visual ideas – which are part of the SuiKan universe – come from? For Jeanne d’Arc, we wondered what she could be if she lived nowadays. Since her banner is one of her main attributes, we turned her into a bus tour guide, leading an army of tourists with her flag floating in the air. Regarding the aesthetics of our videos, we trust the directors we work with. And since now we have a lot of different videos, the new directors look for ideas we didn’t explore yet. That explain the diversity of our videography. To finish this interview, I’d like to talk about Time to Play. It was something so generous, it looked so selfless… How did this project take shape? The whole idea of Time to Play comes from JRA, the organization which manage horse races in Japan, and has a lot of money to spare. We were quite enthusiastic, because it meant that we’d be able to shoot videos with a larger budget than usual. Actually, we did videos with very different means, depending of the project, sometime with no money, some other times with some (which allowed us to create more complex, technical and crazy stuff). 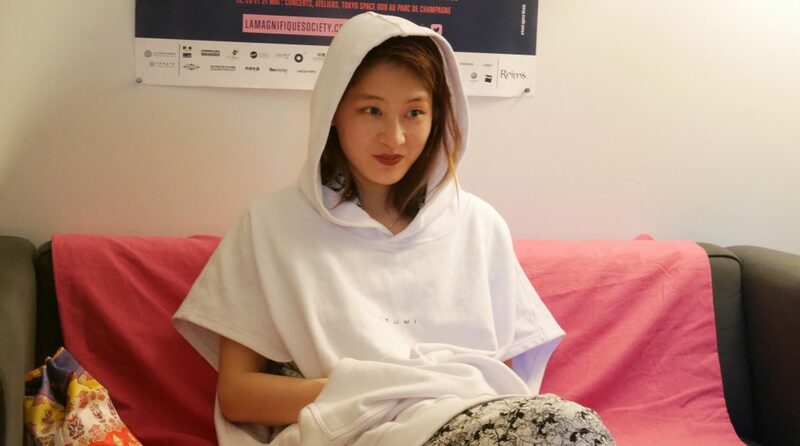 So first, we used a part of the budget granted by JRA to shoot a music video in Mongolia (author’s note: at the time of the interview, Melos is still a secret and hasn’t been released yet – some pictures of the shooting had been published on KOM_I’s Instagram, but everybody thought it was a music video for the song Genghis Khan). When JRA initially contacted us, we met with them. I discovered the horseracing world, and I found the horses very beautiful. That’s why we did this video. I wanted them to be involved in a way or another. So we went to Mongolia, there were horses, obviously, but also raw, rough land. I loved that. Then, we wanted to do a live show. But we quickly discovered that the horseracing world is also kind of similar to the SAT. The trainers are the parents who stress for their kids, the horses are stressed like high schoolers… I really wanted to do a live perfomance during a race, but in these conditions, it was impossible. Beside everybody being stressed, you have to add the fact that, before a horse race, nobody can go on the tracks, so the ground is preserved of any interference. So since a live performance during the races wasn’t possible, we went with an alternative solution, midway between a live show and a music video: large scale live streaming. It was something quite unique, since the whole logistic was dedicated to streaming only. There was no other audience. We’re very happy with this first experience: even if it was a one shot, the live was very good, the light, the sound… everything worked perfectly. It has been a very good surprise, and we’d like to delve deeper with this concept. 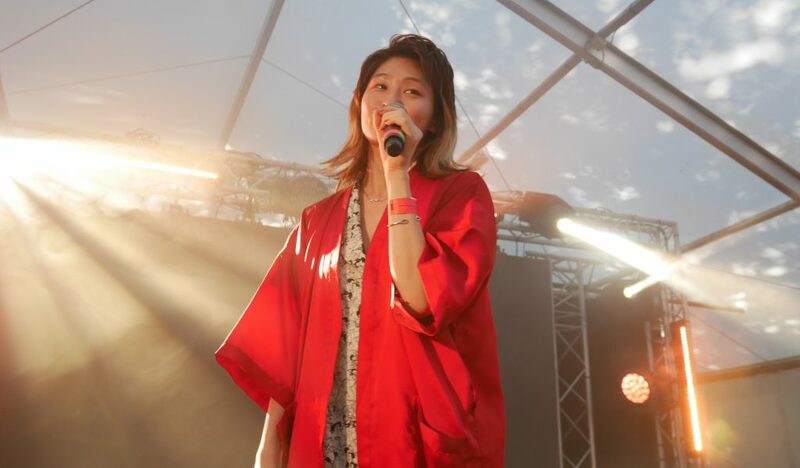 Follow Suiyoubi no Campanella on Twitter, Facebook and Youtube. Thanks to Yoko Yamada from Creativeman, who provided translations from French to Japanese during the whole interview.